– Village at which you can buy/sell or identify items, restore health. – Gain experience and level up. – Use magic such as fireball or frozenball. 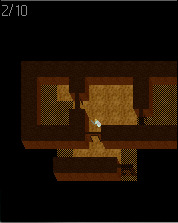 – Find healing shrines and hidden rooms. – Ability to save game in the village every time you are there! – Hidden rooms in the dungeon. – Wear armours, melee and distance weapons. – Use potions to poison your weapon. – Game system with stats as : Strength, Swiftness, Dexterity, Ingenuity, Magic, Vitality.